It's official event name is the All-Okinawa Eisa Festival, but most everyone in Okinawa knows it as the Orion Beer Festival, running Saturday and Sunday at Koza Sports Park in Okinawa City. A better way to describe the festivities at the 52nd annual festival is fun in the sun, mixed with beer, music and lots of eisa dancers. More than a dozen eisa troupes perform on Saturday, while yet another 15 show their stuff on Sunday. Even foreigners get into the act, performing Sunday under the banner of the Okinawa International Friendship Association. 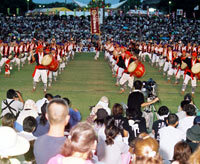 The All Okinawa Eisa Festival was first held in 1956, on what was then known as the Okinawa City Athletic Field. With the Obon holiday behind them, Okinawans are ready to dance even more. Eisa dance is a traditional Okinawan dance using taiko drums, pounding out the beat. Eisa is a mainstay of Obon, a Buddhist holiday that focuses on honoring Okinawan ancestors’ spirits. Saturday and Sunday the dancers begin in mid-afternoon, with Saturday dance beginning immediately after opening ceremonies. The melodious sounds of Okinawa will continue virtually non-stop, with groups each performing 20 minutes. Did we mention the beer? The Orion Beer Festival runs concurrently with the All-Okinawa Eisa Festival in Okinawa City, and yep! There’s a fountain of beer flowing! Orion Beer Festival 2007 adds dimension to the weekend at Koza Sports Park. The local Okinawan beverage will be offered at discount rates to festival revelers. Orion Brewery sponsors a series of huge festivals across Okinawa each summer, including two on Ishigaki and Miyako Islands. The beer festival kicks off Saturday with a grand opening celebration at 4 p.m. The stage opens and live music is under way just after 5:15 p.m. with Akidas. Bourbonz follows at 5:55 P.M., with Emi Tawata at 6:35 p.m. The Orion Campaign Girls make the official “Kampai” toast at 7:20 p.m., leading into the special live performance by theJohnny Ginowan Band at 7:40 p.m. A gala fireworks display rounds out the evening at 8:55 p.m. Saturday, and at 8:50 p.m. on Sunday. More than 200,000 visitors have trekked to the joint festival in past years, and organizers expect nothing different this year, as the Eisa Festival celebrates its 52nd year. Look for brilliant colored costumes and uniforms unique to each municipality performing. Some eisa groups are using the same costumes today they’ve used for more than 300 years. The music follows drums and sanshin, an Okinawa three-string instrument, while dancers sway gracefully. Some dances work in various karate moves as Okinawa’s Uchinanchu heritage is spotlighted. Organizers remind festival goers that coolers and lawn chairs are not permitted. No alcoholic beverages are permitted to be brought onto the festival grounds, but there is plenty of alcohol available for sale throughout the two-day event. Live music Sunday on the Orion Beer Stage starts with Glean Piece at 5:20 p.m., followed by Hisano at 6 p.m . Minamukani Drops performs at 6:40 p.m., and the Orion Beer Girls take to the stage for a Kampai at 7:20 p.m. Diamantes takes center stage for the main evening performance at 7:40 p.m..
must drive, travel south from the northern camps and bases, getting off at Exit 4, Okinawa Minami. From the tollbooth turn right at the intersection and follow the crowd. Traveling north on the Okinawa Expressway, again, Exit 4. The drive is about 40 minutes from Naha International Airport.